Call it whatever you like, gluten free lasagna, savory cabbage cake, or absolutely delicious, either way it is a guaranteed hit. 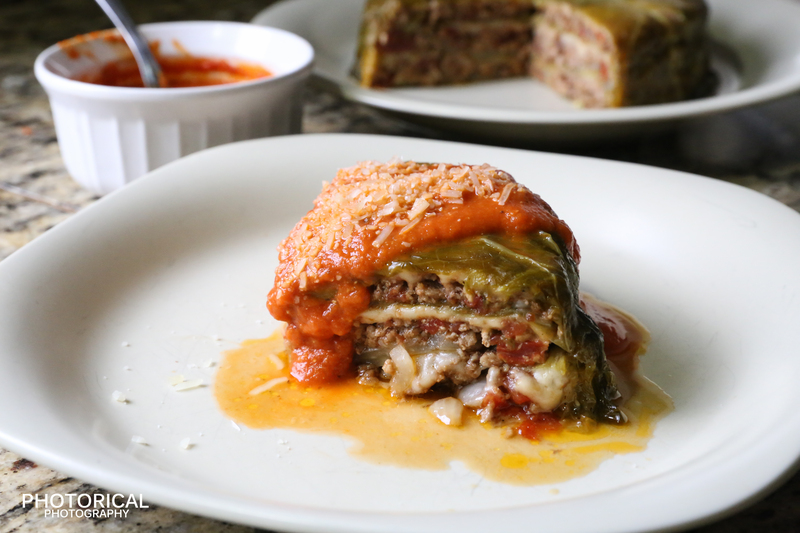 I have made cabbage rolls before and this recipe is close to the same concept, but layered and served like a cake. It is undoubtedly less messy and time consuming, looks cool, and a surefire way to impress guests. 1/2 large head of cabbage per cake or approximately 9-10 full cabbage leaves for two. 1/2 cup tomato purée for garnish (pour over cooked cabbage cake before serving. bring a pot of water to boil and cook your cabbage. 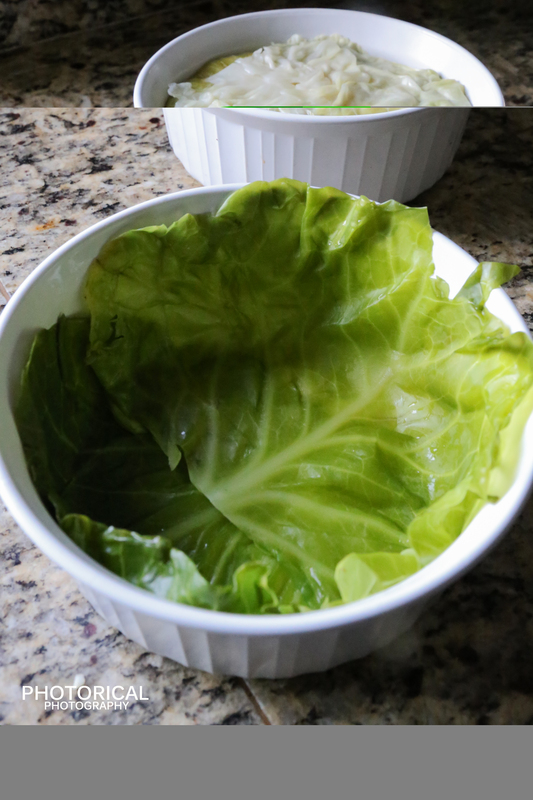 Cut enough of the bottom stem off so the cabbage leaves separate from the cabbage while cooking. If you can, cut out only the core from the bottom and leave the leaves in tact. It will take about 30 minutes for the cabbage to cook enough to release from the cabbage ball without breaking. If they are still stiff, they need to cook longer. While your cabbage is cooking, cook your rice. 1/4 cup of uncooked rice will yield about 1 1/2 cup cooked. You want to undercook the rice slightly so it can continue cooking once you mix with the meat and bake as a cake. Also, par-baking prevents the rice from turning to mush when you mix with the raw meat. The grains will stay in tact this way. Use 1/2 cup water and 1/4 cup rice. Bring the water to a boil with the lid on, then add your rice. Cook the rice until all water is absorbed by the rice in cooking. This won’t take long, so watch it so it doesn’t burn. Remove from heat, keep covered. 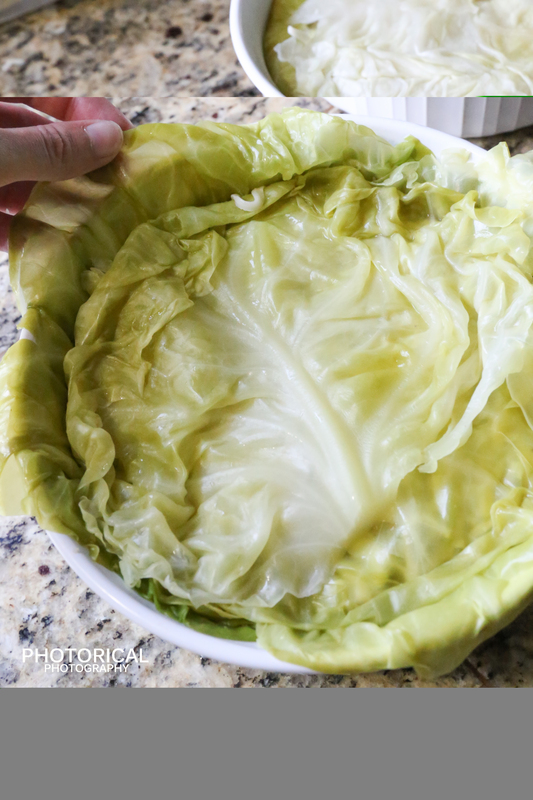 Remove your whole cabbage from the pot and set on a thick towl that can absorb moisture expelled from the cabbage. 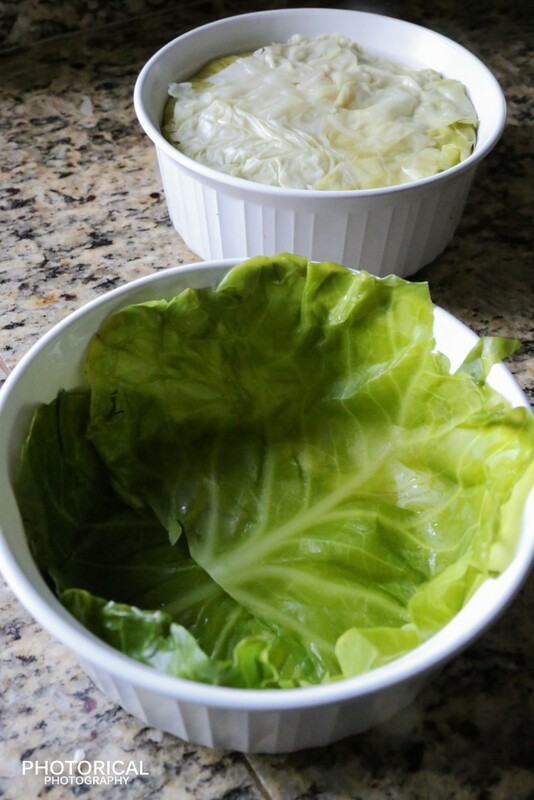 Line a circular casserole dish with cabbage leaves. I used 3 for the bottom. Of your leaves are larger, you may only need one or two. The higher up the sides you can get the leaves the better. 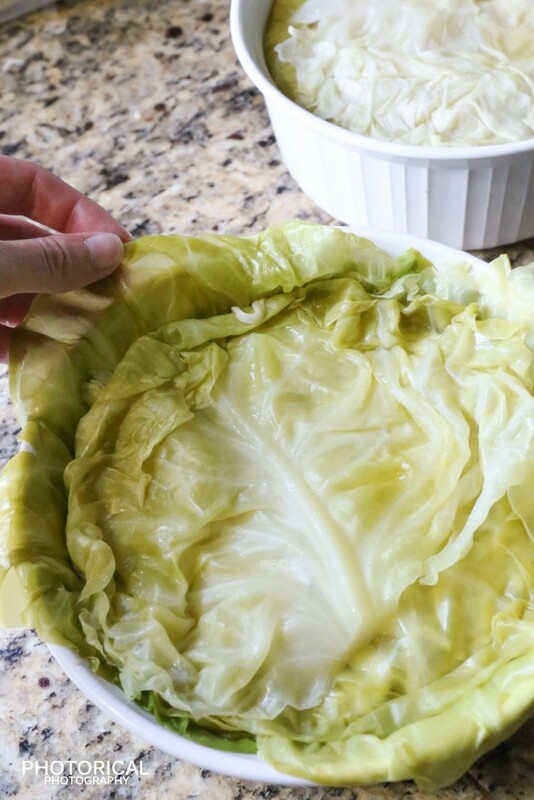 Cover up any cracks with cabbage to prevent the next layer from leaking through. 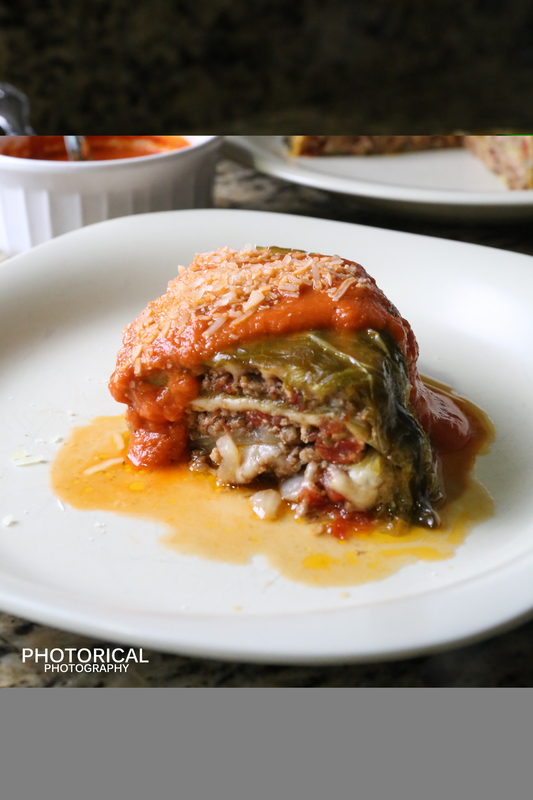 Sprinkle cheese over the bottom layer of cabbage, followed by a layer of meat mixture. 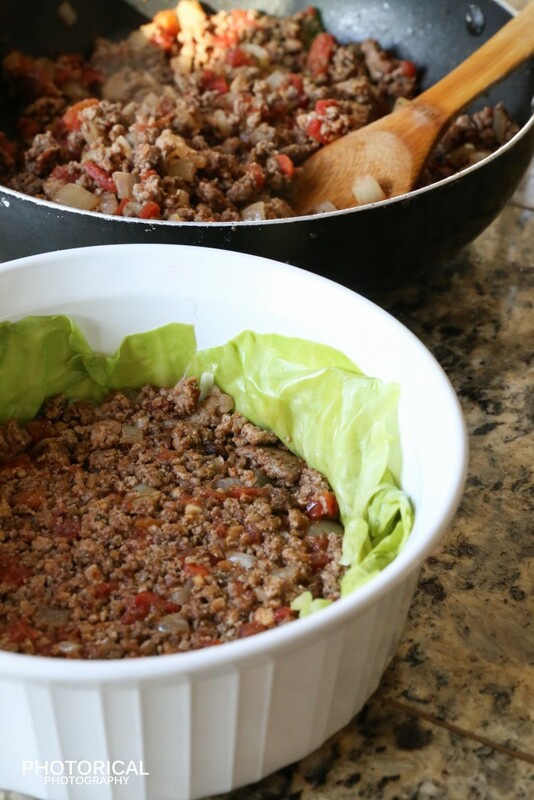 Pack that layer well before covering with another layer of cabbage. Repeat until you reach the top of the casserole dish. At this point you should have access cabbage hanging over the sides of the dish. 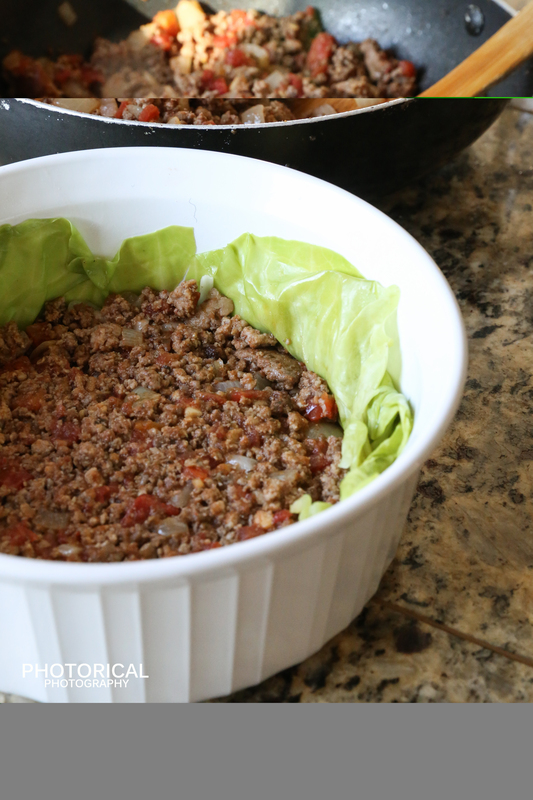 Place your last layer of cabbage over the meat and seal with overhanging cabbage. lightly brush cabbage top with butter or olive oil and Bake in the oven for 30-40 minutes at 350 degrees. Once cooked, let it cool in the dish so the juices can firm. Turn casserole dish out over a cutting board, cut and serve. I covered my cake with a tomato vodka sauce and parmesan cheese. Adds an extra kick of flavor in my opinion.